Villa T2037 has all the ingredients for a luxury holiday. 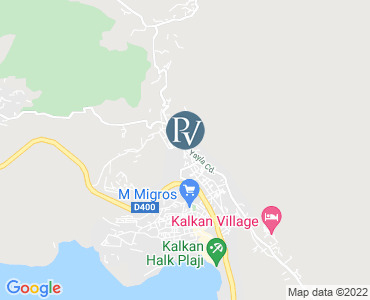 Situated in a quiet location with olive trees to the front and mountains to the side, this private villa has sweeping views across the turquoise coloured bay, yet is still 15 minutes walking distance of Kalkan town, harbour and beach. The incredible sea views can be enjoyed from all floors, as well as from its 40m2 private pool, sun terrace with built-in BBQ, balcony which sweeps across the first floor, and its large roof terrace. Inside, this air-conditioned villa has 7 bedrooms (4 en suite) all with balconies or terrace access, 4 marble bathrooms, a fully fitted granite kitchen, and spacious lounge, The villa accommodates 14 people comfortably and is less than 5 mins walk from a mini-market, fruit and veg stall and Turkish cafe. Kitchen 1: The modern design fully fitted open plan kitchen equipped with Fridge freezer, Dishwasher, Washing machine, Oven, 4-Ring hob, Microwave, Electric kettle, Toaster, Dinner set for 14 people, Pans, Stewpots, Cutlery, Knives and etc. Lounge 1: Seaview, Classic seating group, LCD Satellite TV, DVD player, Wifi, Air conditioning, Table and chairs for 6 people, Bathroom and Access to pool and patio area. Bedroom 1 is a Double Bedroom with En-suite, Nightstand, Dressing table, Wardrobe, Air conditioning, Bathroom with Shower and Access to the pool and patio area. Bedroom 2 is a Twin Bedroom with Nightstands, Dressing table, Wardrobe and Air conditioning. Bedroom 3 is a Double Bedroom with En-suite, Seaview, Nightstand, Dressing table, Wardrobe, Air conditioning, Bathroom with Shower and Access to the pool and patio area. Kitchen 2: The modern design Kitchen is fully equipped with Fridge, Dishwasher, Washing machine, Oven, 4-Ring hob, Microwave, Electric kettle, Toaster, Dinner set for 12 people, Pans, Stewpots, Cutlery, Knives and etc. Lounge 2: Seaview, Classic seating group, LCD Satellite TV, DVD player, Wifi, Air conditioning, Table and chairs for 6 people, Bathroom and Access to the large front balcony, Seating group. Bedroom 4 is a Single Bedroom with Seaview, Baby bed, Nightstand, Wardrobe and Air conditioning. Bedroom 5 is a Double Bedroom with En-suite, Seaview, Nightstand, Dressing table, Wardrobe, Air conditioning, Bathroom with Shower and Access to the front balcony. Bedroom 6 is a Twin Bedroom with Seaviews, Nightstands, Dressing table, Wardrobe, Air conditioning and Access to the roof terrace. Bedroom 7 is a Double Bedroom with Seaviews, Nightstand, Dressing table, Wardrobe, Air conditioning and Access to the roof terrace. Roof Terrace with heavenly seaviews. There is a table and chairs and 2 Sun loungers. Large private swimming pool. Spacious sun terrace which is furnished with loungers, dining table and chairs for 12 people. Terrace with stunning views of the bay and the mountains. All prices are per week for the villa only. Flexible changeover day, Please note that availability shown is subject to confirmation - please call our reservations team.